RALEIGH, N.C. — Test drive a robot, build a boat out of duct tape, or check out the award-winning solar vehicle Apperion. The possibilities are endless as you check out Triangle SciTech Expo at the North Carolina Museum of Natural Sciences and immerse yourself in the excitement of STEM (Science, Technology, Engineering and Mathematics), Saturday, April 13, 9 a.m. – 4 p.m. Free. Special to this year’s event, and on display at the Museum beginning April 13, Appalachian State University’s competitive solar vehicle Apperion, which last year placed 2nd in the annual Formula Sun Grand Prix (it placed 3rd the year before). Or take in “STEM: The Musical,” the perfect STEAM fusion of the arts and sciences. This 50-minute live-action production, often described as “Hamilton for the sciences,” features singing, dancing and all-ages STEM content. Visitors can also learn about the art and science of fermentation, how drones work and how they are being used in science, the varied technologies used to study forming stars and to look inside meteorites, or the connection between horseshoe crabs and nanoscience. Or check out live (and lively!) chemistry demonstrations with liquid nitrogen and dry ice. 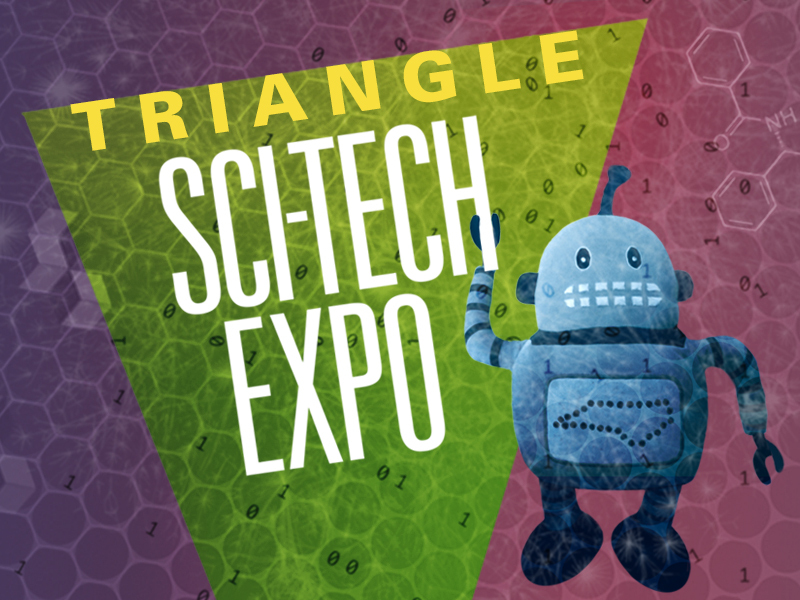 Featuring more than 50 hands-on exhibits, games, crafts, activities and presentations, Triangle SciTech Expo is a unique event that assembles scientists and technical professionals from universities and industry to engage visitors of all ages in the world of STEM. Visitors will learn about the Triangle area’s history and promising future as a leader in these fields, as well as why these fields are important to their daily lives. Triangle SciTech Expo is an Official Expo of the NC Science Festival and is sponsored by Biogen Foundation. Find out more at naturalsciences.org or follow #TriSciTech on Twitter or Instagram. The North Carolina Museum of Natural Sciences in downtown Raleigh (11 and 121 W. Jones St.) is an active research institution that engages visitors of every age and stage of learning in the wonders of science and the natural world. Hours: Monday–Saturday, 9 a.m.–5 p.m., and Sunday, noon–5 p.m. General admission is free. For more information, visit naturalsciences.org.